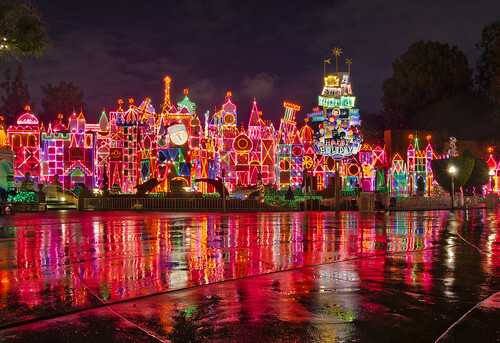 Disneyland - "it's a small world" holiday, a photo by Tom Bricker (WDWFigment) on Flickr. "it's a small world" holiday looks pretty beautiful throughout the Christmas season, but there was no time during our trip when it looked more beautiful than during and after the rain. As everyone else was running for cover when it started pouring, I pulled out my camera (thankfully it's weather sealed and I have a poncho for it!) and began playing! Much like a kid in the winter standing outside singing, "let it snow, let it snow, let it snow," I was outside shouting, "let it rain, let in rain, let it rain." I don't think my shoes have ever been more soaked than they were that night, but it was totally worth it! I've started our Disneyland Christmas trip report on DineyTouristBlog. Click that link to go to the index. Part 2 is now up, and Part 3 will be up later today (12/7).